In early 1862, the Union advances achieved by Maj. Gen. Grant and Adm. Foote at Forts Henry and Donelson caused significant concern in the Confederate government. The Union army, known as the Army of the Tennessee, under Grant had increased to 48,894 men and were encamped on the western side of the Tennessee River. On April 6, 1862 a determined full-force attack from the Confederate Army took place at the Battle of Shiloh; the objective was to destroy the entire Western Union offensive once for all. Over 44,699 Confederate troops led by Albert Sidney Johnston and P.G.T. Beauregard, vigorously attacked five divisions of Grant’s army bivouacked nine miles south at Pittsburgh Landing. Aware of the impending Confederate attack, Union troops sounded the alarm and readied for battle, however, no defensive entrenchment works had been made. The Confederates struck hard and repulsed the Union Army towards the Tennessee River. Grant and Maj. General William T. Sherman were able to rally the troops and make a stand. After receiving reinforcement troops from Maj. Gen. Don Carlos Buell and Maj. Gen. Lew Wallace's missing division, Grant succeeded in stabilizing the Army of the Tennessee. Confederate General Johnson was killed in the battle on the first day of fighting, and on the second day, Grant launched a costly counter-offensive and pursuit that forced the Confederate Army, now under P.G.T. Beauregard, to retreat to Corinth. The battle was the costliest in the Civil War up until this time, having 23,746 combined Union and Confederate casualties. The carnage at Shiloh demonstrated to both Confederates and Unionists that the Civil War was both very serious and extremely costly. Shiloh was the first battle in the American Civil War with tremendous casualties and Grant received much criticism for keeping the Union Army bivouacked rather than entrenched. As a result, Grant's superior Maj. Gen Henry Halleck demoted him to second-in-command of a newly formed 120,000-strong Union Army. Grant was ready to resign from command when Maj. Gen. Sherman talked him into remaining in Halleck's army. After Halleck slowly moved on Corinth unopposed, the 120,000-man army was broken up and Grant returned to his previous command over the Army of the Tennessee. Before all of the generals relived the Battle of Shiloh in their memoirs, they wrote official accounts of the campaign to their superiors, and those accounts were preserved in the Official Records. This collection of Union generals’ accounts of the battle includes the accounts of Commanding Generals Ulysses S. Grant and Don Carlos Buell, as well as important Generals William Tecumseh Sherman and Lew Wallace. It is specially formatted with a Table of Contents for each general’s account, and pictures of the generals who fought in it. Finally I get this ebook, thanks for all these Official Records of the Union and Confederate Armies: Union Generals’ Accounts of the Battle of Shiloh I can get now! 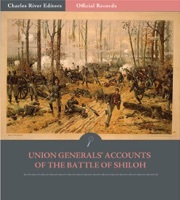 Official Records of the Union and Confederate Armies: Union Generals’ Accounts of the Battle of Shiloh was the best books I ever buy. Official Records of the Union and Confederate Armies: Union Generals’ Accounts of the Battle of Shiloh did exactly what you said it does. I will recommend you to my colleagues. Official Records of the Union and Confederate Armies: Union Generals’ Accounts of the Battle of Shiloh is the most valuable books we have EVER purchased. I'd be lost without this. I am completely blown away.